Since 1963, Klaussner Home Furnishings has been the leading solutions provider to the furniture industry. Their mission is simple: to provide value-driven product, constant innovation, speed-to-market and total customer satisfaction. Through strategic acquisitions, domestic and overseas partnerships and state-of-the-art inventory control and manufacturing/shipping options, Klaussner has created a vertically integrated furniture powerhouse with one of the fastest delivery times in the industry. Klaussner manufacturers over 70% of its products domestically through its five manufacturing campuses in North Carolina—Asheboro serves as the home to the corporate headquarters. Klaussner Outdoor follows with the same great service to customers who want quality product with quick delivery shipped in the most economical way. We offer all-weather wicker and aluminum for outdoor living that is comfortable, stylish and durable. 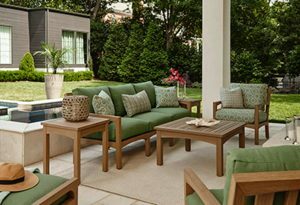 From categories that allow customization with beautiful outdoor fabric selections to styles that are simple and effortless with limited choices,Klaussner Outdoor is proud to be your solutions provider for outdoor living.